You try to do something but not sure how to do it. More and more, you’ve probably found yourself turning to YouTube for an informational video in order to learn how you do it. In fact, chances are, in recent times you’ve found yourself consuming more video content than you’ve done before. In fact, video marketing statistics tell us that people will spend an average of 47.4 minutes a day viewing online videos this year, up considerably from 39.6 minutes in 2016, on platforms like Facebook, YouTube, Netflix, and other platforms where video content can be consumed. Moreover, 85% of people say they’d like to see more video from brands in 2018. Unless you’ve been living under a rock for the last couple of years, it has been difficult to miss the fact that video content has increased dramatically in popularity. As a brand, or someone looking to build an audience, you always want to look at what people are asking for, and then deliver it to them, and right now, people are screaming for video content. The best part about video content isn’t just that the interest in video content has increased, but it has also proven to be tremendously effective in marketing due to it convincing powers, and that it helps you storytelling in a way that just isn’t possible through audio or text. If a picture says more than a thousand words, how many words does a video which is recorded in 60 fps say? In theory, it would say a whole lot more, and the truth is, it does! In fact, one of the video marketing statistics says that a minute of video is worth 1.8 million words. I’ve been writing over 1,000 blog posts and I’ve just merely surpassed that limit. This statistic alone should prove the incredible power of video content, especially in marketing, as it allows for storytelling in a way that just isn’t possible with other content types. Through video content, you can captivate your audience’s attention and keep them glued to your video, while, at the same time, impacting them at a much deeper level thanks to the deep level of emotional impact that video content has. create a one-minute video or write a thousand blog posts? I’ve been writing for more than one and a half year, almost every single day consecutively. If I’d create and record a video and put energy and thought into it, I’d be done within the week. Is it worth investing in video marketing? With the few video marketing statistics I’ve revealed so far, the answer should be a most definitely yes, and that is only the beginning. The problem when asking ”is it worth investing in ____?” is that the answer is always that it depends. What is the ROI of a basketball? For LeBron James and other famous basketball players, it’s more than a billion dollars. It means that the video marketing statistics that I’ve presented (and the video marketing statistics that we’ll be looking at in this post) clearly proves that video marketing works. Now, it is up to you and how you use it. An electric screwdriver is a tremendous tool, but unless you’ve charged it, it won’t do a lot for you. And that’s the exact same principle that is true to video marketing as well. If you don’t know how to use it properly, it won’t be worth investing in video marketing, but at the same time, the internet gives you the absolute best preconditions to learn how to leverage video marketing properly and succeed, and so if you know how to use it, you will be able to generate similar results as the video marketing statistics present, and that, my friend, are results that most certainly makes it worth investing in video marketing. While some people love talking about how amazing things are (which might not necessarily be), I prefer being more raw, honest, and someone who gives a more actual picture of the reality. And that reality is that, as you’ll learn from the video marketing statistics, video marketing is incredibly powerful in marketing, but only if you know how to use and leverage it. Video consumption has increased dramatically over the years due to a number of factors. Firstly, the cost of distribution has substantially been reduced, to the point now where anyone anywhere can distribute content on social media platforms at zero cost. At the same time, these social media platforms, and the internet as a whole has made video content so easily accessible that it is only a button’s click away. Today, virtually anyone anywhere can access and consume video content. What’s more, in marketing, video allows, as mentioned, brands to storytell and impact their audience at a much deeper level due to the power of video content. In other words, though video content, brands can tell their story and get their audience to actually listen to and consume it. In other words, get their point across and the message they’re trying to make. Now, the first reason why video content has proven to be so powerful in marketing is the reason that I’ve already talked about a lot, and that is that it opens up completely new opportunities to storytelling and convey a message to your audience. Secondly, video activates two senses and keep them activated simultaneously. When you’re watching a video, you’re most often watching it with sound on, and this means you’re consuming the content using both your eyes and ears. With that said, you’re probably no stranger to the fact that we engaging multiple senses help humans learn. This means that by leveraging video in your marketing, you’ll not only be able to impact your audience more thoroughly due to the art and power of storytelling, but you’ll also make your audience learn and remember more about your brand and the message that you’re trying to convey. And really, that’s exactly what you want all of your marketing efforts to do: make your audience remember about your brand and your message. 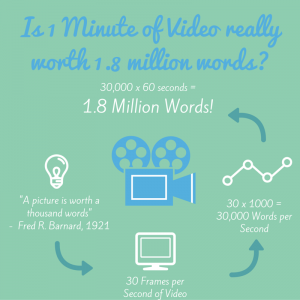 Lastly, remember that a picture says more than a thousand words, and a minute of video is worth 1.8 million words. This ties together with the infamous quote by the Russian playwright Anton Chekhov, who gave birth to the quote ”Show, don’t tell”. And this is exactly what video content allows you to do, a much greater extent than any other form of content. Marketers who work with video get 66% more qualified leads per year. Marketers who work with video achieve a 54% increase in brand awareness. Of the late-stage prospects, 75 percent of those who received a personalized video became closed deals. Including a video on a landing page can lead to a conversion rate increase of 80 percent. 64% of users are more likely to buy a product online after watching a video. Companies that leverage video see a 41% increase in website traffic from search engines compared to non-users video users. Including a video in an email leads to a 200-300% increase in click-through rates. In marketing, the three most effective types of video content are customer testimonials (51%); Tutorial videos (50%); Demonstration videos (49%). This is a very interesting video marketing statistic because it leaves us wondering why these types of video formats are most effective. The fact is that these types of video content are only effective in marketing if people actually want to consume them, and so this means that the list of the most popular types of video content which people like to consume would look similar, if not identical to this one. And that makes sense, because if you’d be creating content that no-one wants to watch, it wouldn’t perform very well, but on the contrary, if you would create video content which people wants to consume, it would perform tremendously well, all because the success of marketing efforts are dependent on the attention of your audience. Personalized videos have a 16x increase in click-to-opens and a 4.5x increase in total/unique click-throughs. This video marketing statistic maybe doesn’t come as a surprise considering the immense power of personalization in marketing, not just in video. By personalizing your videos to your customers, you make them feel unique and special. Most importantly, it makes them feel valued and seen, which leads to not only them valuing your videos more, but makes them more loyal to, and engaged in your brand. 67% of marketers have found video marketing ”somewhat successful”. This is one of the video marketing statistics that prove the power of video marketing. The question ”what’s the ROI of video marketing?” is asked quite extensively, and this statistic proves that video marketing is indeed effective in marketing for a lot of marketers, as a staggering 67% of them reports finding it somewhat successful. And considering my anecdote about the importance of knowing how you use something, I am convinced that that number could be much higher if just marketers knew how they could use it. In 2016, 60% of marketers used videos in their social media marketing. I promise you this, a few years before 2016, that number was far from that high, and the fact is that the number will only continue to increase. There are several factors to the increased interest and usage of video marketing among brands, but one of the most important factors is that it has proven to clearly work. At the same time, the demand and consumption of video content have increased among consumers, partly because of its easy access. Today, the vast majority of social media platforms support video content, and so sharing it with your audience isn’t difficult. What’s more, video content has also proven to perform very well on social media, partly because the main type of content on social media platforms isn’t video content, so sharing videos means that you can stand out from the crowd. Of B2B marketers, 30% say video will be key to content marketing success. Video content is playing a bigger and bigger role in content marketing, and a part of that has to do with the fact that the demand for it is increasing. As a marketer working with content marketing, you want to look at what the consumers are asking for and deliver it to them, and today, consumers are screaming for video content more than ever before. This means that chances are that your video content will perform quite well. 1 in 4 consumers lose interest in a company if they don’t have video. This is yet another of the video marketing statistics that prove the direction in which the marketing and content consumer landscape are heading. Back in the days, people didn’t consume anywhere close to as much video content as today, but now, more than 25 percent of them actually expect you to have video content, and if you don’t they’ll lose interest in you. This ties back to what I talked about earlier about the importance of giving your audience what they want. Today, more people than ever want video content, and you need to give it to them if you want to keep their attention and ultimately be able to impact them marketing wise. 34% of B2C marketers say video content is crucial to marketing success. People always come up with excuses to why they shouldn’t do something, and a common argument is that video marketing doesn’t work for B2B marketers, while, at the same time, B2C marketers say that video marketing doesn’t work for them. But the fact of the matter is that the two video marketing statistics we’ve looked at clearly proves that it is just not true. Video marketing is universal and both B2B and B2C marketers say that video content is crucial to marketing success. In other words, no matter if you’re operating in the B2B or B2C space, video marketing will work, as long as you leverage it properly. 76.5% of marketers and small business owners are getting results with video marketing. This is yet another one of the video marketing statistics that prove that video marketing does indeed work. The vast majority of marketers find video marketing effective, and as long as you use it properly, so will you! 83% of marketers and brands who use video marketing report that it gives them a good ROI. No matter what people say about video marketing, the statistics speak clearer than anything else. The absolute vast majority of marketers say that video marketing gives them a good ROI. It’s so interesting to hear people who have opinions about something that they’ve never executed on, or just used briefly and then drawn a conclusion from that. Obviously, if you upload one single video to social media without any followers or anything, then obviously video marketing won’t be effective for you. This is why, I believe that this number should actually be higher, only that many of the marketers who have executed on video marketing have either used it too short, used it improperly, or hardly leveraged video, and then reported that it doesn’t work. At the same time, 83% is a quite high number, which clearly proves video marketing does work, and it works for the vast majority of businesses. Personally, I believe it works for everyone, it’s just about how you use it. There’s no arguing whether video marketing works or doesn’t work, because it clearly does. 82% of marketers and brands think video marketing is a key part of their marketing strategy. Not only are marketers finding video marketing effective, but they also believe that video marketing is an important part of their video marketing strategy. What this shows is that the marketing landscape has evolved a lot, because five years ago, that number was very low, and far from as high as 82 percent. When something works in marketing, you clearly want to focus more on it, and that’s exactly what marketers do. This is also the reason why they consider video marketing to be an important part of their marketing strategy. If there were no obstacles like time, resources, and budget, 73% of marketers report that they’d create more video content. Okay, so there’s no denying that video marketing works, and clearly, you should be focusing on doing the things that have proven to be effective in marketing. Video marketing has done just that. And what’s so interesting is that a high percentage of marketers say that they would create more video content if there wouldn’t be any obstacles. It’s no secret that creating videos demand resources and time, yet at the same time, it has proven to be very effective. Additionally, you wouldn’t want to do more of something that isn’t working, and so this is yet another of the video marketing statistics that proves video marketing does work, and that it works extremely well. Blog posts that incorporate video generate 3x as many inbound links as blog posts without video content. If you know the psychology of humans and how we consume content, this maybe doesn’t come as a surprise. Humans are visual creatures, and our brain processes visual content much faster than text. At the same time, we don’t have to actively work to consume a piece of content, for example by reading, when watching a video. That we are visual creatures also leads to most people learning better by consuming video content as opposed to reading. Therefore, by incorporating video content in your blog posts, you not only break up your content and make it more easily digestible, but you are also able to support the message you’re trying to convey, and the point you’re trying to make by leveraging video content. 94% of businesses see video as an effective tool in marketing. There’s not much to say about this video marketing statistic other than the fact that it clearly works in marketing. Combining video with full-page ads have shown to boost engagement by 22 percent. It’s no secret that traditional display ads are losing power and thus click-through rates. The good news is that people love to consume video content, and so by incorporating video with your full-page ads or really leveraging video in any type of display ads, you can increase engagement and drive better results. Not only do you increase the interest in the ad, but the best part is that with video content, you can storytelling in a much better way, and engage your audience in the message of the video, which obviously leads to greater engagement and ultimately also results. The average length of videos from B2B videos are 8 minutes long. How long the videos you create should be is a common question, and here, you have one answer. Note that just because the average length of videos from B2B brands are 8 minutes doesn’t mean that 8 minutes is the ultimate time for the best performance, so, therefore, you shouldn’t just look at that number blindly and only create 8-minute videos. Instead, use this length as a starting point to experiment and figure out what length is ideal for you. Because what works for one business might not work for you. The most important thing is what your video is about, and how long it needs to be for you to be able to convey the message you’re trying to make. The open-to-reply rate of emails has been found to increase by 8x when the email contains a video. Back in the days, when almost no brand did email marketing, the open-rates were 90 and sometimes even close to one hundred percent. Of course, that’s not the reality today, but the fact is that email marketing has proven to be able to still generate great results. it’s just that in order to still be able to find success from it, you need to tweak your strategy and find new ways to increase the open and click-through rate. This statistics proves that including a video marketing is a great idea as it helps make your email more engaging and thus helps it generate greater results. 69% of people have been convinced to buy an application or software by watching a video. With video content, you have a completely different opportunity to storytell, engage, and emerge your audience into the point you’re trying to make, and rather than tell your audience how amazing your product is, show them. Several of the video marketing statistics we’ve looked at prove that people are engaged in video content and more likely to watch it, but these statistics prove that it actually helps drive real results, the end result of all businesses, which is to sell more. Social media video generates 1200% more shares than text and images combined. This statistic is absolutely huge and proves just how incredibly powerful video content is on social media. As mentioned, video content hasn’t been the most common type of content on most social media platforms (except for platforms solely focused on it), but as the interest in video increases, so will the results you generate from it- if you take the opportunity and leverage it. The future of social media is becoming more and more focused on video content, and if you are still neglecting it, you’ll miss out on tremendous opportunities, and eventually, when you realise the importance of video content, it will already be too late, or at least harder to gain traction and cut through the noise. Video posts on Facebook enjoy a 135% greater organic reach than photo posts. Videos perform much better on Facebook than photo posts, and this doesn’t come as a surprise considering the fact that humans are visual creatures, and a picture says more than a thousand words, while videos say millions. What’s more, many people turn to Facebook to consume videos, and what Facebook’s algorithm’s goal is is to present people what they want to see, and the things that are more relevant to them, and when the interest in video content increase on the platform, so will the organic reach for video posts. With that said, if you aren’t yet uploading videos to Facebook, and complaining about the organic reach on the platform, try uploading videos and do it natively on the platform, and you’ll see an increase in the organic reach of that post. Storytelling has proven to be incredibly powerful for convincing people to take action. Much more powerful than any other type of content, since it allows you to tell a story, and bring your audience with you on that story. Since you have the possibility to impact your audience on a much deeper level by leveraging video content, obviously they’ll be more convinced to take action after viewing your video, even if it is an ad. After Google, YouTube is the second most trafficked site. YouTube is often referred to as the second largest search engine in the world, and at the same time, it is also the second most trafficked site. The fact that a video sharing platform is the second most trafficked site in the world is quite an incredible fact since it tells us just how powerful video content is. The demand for video content is huge, so huge that the second most trafficked site in the world is a video sharing platform. This should tell you something about the power of video content in marketing. 4 times as many customers prefer to watch a video about a product as opposed to read about it. This is one of the video marketing statistics that focus on the human psychology of video content. Humans are visual creatures, and not only do the vast majority of people prefer to consume video content before text, it is also more impactful. Since we are visual creatures, most people learn better by consuming video content as opposed to reading. And obviously, people choose to consume the content which they learn best from. As a brand, this is extremely important because when you market your brand, product, service, or just want to inform your customers about something, you want to educate and teach your audience about something. As such, you want to leverage the content which they learn best from, and for the vast majority of people, that content is video. 80% of marketers report that video has increased dwell time on their website. Since video content is much more engaging than text, and since more people prefer to consume video content, this is one of the video marketing statistics which doesn’t really come as a surprise. As a marketer, you are fighting for your audience’s attention, and you are fighting to keep their attention, not just get their attention for a few seconds then lose it. This is why you want to do everything you can to keep them glued to your website, and one of the tactics you can use to do just that is by leveraging video content. Since video is so immensely engaging, it means that you’ll keep your audience’s attention and increase your dwell time. 75% of consumers say that they have not bought a product because the voiceover annoyed them. When creating your videos for marketing, this is a statistic that is worth thinking about. If you plan on making a voiceover for your video, consider this, and make sure you do voiceovers that don’t annoy your audience. 12% purchased the specific product featured in the video ad they watched. Since video content is so impactful and engaging, just having your audience watch a video can convince them to purchase it. But this ties back to the importance of showing, not telling. People don’t want to watch a video where you talk about how amazing and awesome your product is, and that they need to buy it. If you create those types of videos people will stop watching immediately. Instead, the way you convince people is by showcasing a problem that you know your audience is often facing, storytell the problem and pain which this causes, and then show how your product solves this problem. 81% of businesses report using video as a marketing tool. Obviously, people wouldn’t use it unless it was effective, and when a staggering 81% of businesses use it, you can imagine its power in marketing. More than 50% of marketing professionals say that video is the type of content in content marketing that has the best ROI. Of all the content marketers can produce, more than 50% of them say that video is the content that has the best ROI. This is one of the video marketing statistics that proves that not only does more and more brands use video marketing, but they’re also finding great success from it. Again, this doesn’t come as a surprise considering the opportunities that video content opens up, and the opportunities it gives brands when it comes to storytelling and impacting with a message. People aren’t convinced to by something if you tell them to buy something, instead, they’re convinced by stories, and this is what video helps you do, thus explaining its impressive ROI. Facebook is grabbing more and more land within the video landscape, and now, more people than ever are sharing videos on Facebook. As mentioned earlier, video content also performs tremendously well on Facebook and has a much higher organic reach than any other piece of content. If you’re contemplating where you should share your videos, Facebook is a great place to start. 87% of marketers who posted video content on Facebook found it to be an effective strategy. As mentioned earlier, the organic reach of videos on Facebook is higher than for any other type of content, and it is also the type of content which people prefer to consume when on Facebook. This results in video content performing tremendously well on the platform, and therefore something you want to take advantage of. I’ve already shared a number of video marketing statistics which proves that Facebook is a great platform to share video content on, and within the near future, the demand for, and usage of video content will only continue to increase. People consume more video content on the platform, and as a marketer, you need to provide your audience what they want. Since Facebook is a platform where video content works so well, more and more marketers turn to it, and so should you. Live video has skyrocketed in popularity over the years, and this is just several of many video marketing statistics which proves its importance in marketing, and how more and more marketers pay attention to it. More and more social media platforms have introduced live video features, including Facebook, Instagram, and Twitter, and they have done so because the interest and demand for live video have increased. Live video enables brands to engage and interact with their audience in real-time, and thus share a video with their audience that is much more engaging than any other pre-recorded video. Since the video is broadcasted on the spot, live videos also come off as much more authentic for brands and this enables them to build much deeper relationships with their audience. Just one or two years ago, almost no brands were broadcasting live videos, but today, that number has already reached 34%, on Facebook alone. This is most certainly a video marketing trend that will only continue and increase in popularity, so take advantage of the many benefits of live video. 81% of marketers who used Facebook Live say that they found it to be an effective strategy. There’s a clear correlation between the demand for live video and the number of brands who have now made live video a part of their strategy. Something I’ve emphasized a lot in this post is that you, as a marketer, need to give your audience what they want, and right now, live video is hotter than ever. Because when you give your audience what they want, you’ll see great results from it. This is the reason why 81% of marketers who use Facebook live have found it to be an effective strategy. What’s more, since live video is so new, the competition among consumers is quite low, and therefore, cutting through the noise is very easy. So before the competition in live video gets too tough, try live video and see how it is working for you. 37% of marketers plan to use Facebook Live in 2018. This is yet another of the video marketing statistics which proves how live video has skyrocketed in popularity over the years, and now is starting to become a natural part of many brands’ marketing strategies. Live video enables brands to do lots of things that regular videos content just can’t do, including engaging and interacting in real-time, and so it’s not very surprising that more and more brands add it to their content marketing strategy. In the next year, 46% of marketers plan to add Facebook video marketing/distribution to their content strategy. You’d believe that YouTube would be on top of the list of social media platforms that brands are hopping on to and leveraging when it comes to video content, and despite YouTube still being the top player when it comes to distribution of video content, Facebook is gaining more and more traction, and is being added to more brands’ video marketing strategies since it is a platform that clearly works when it comes to video content. If you haven’t yet added Facebook to the platforms where you are sharing video content, you need to do so now. The best part is that, despite what many people think, one doesn’ have to exclude the other. In other words, why not leverage both YouTube and Facebook (as well as other platforms) for distributing your video content. 67% of marketers report having paid to boost or advertise video on Facebook in the last 12 months. It’s no secret that the organic reach on Facebook has declined steadily over the last couple of years as the amount of content being shared on the platform increases. And while video content on Facebook performs much better than other types of content when it comes to organic reach, in order to reach more people, leveraging Facebook ad can be a good idea. The best part is that due to Facebook’s advanced and specific ad targeting, you can create Facebook ads with a tremendous ROI, which ads on Facebook have proven to be able to do. But the fact of the matter is that it’s not only the fact that more and more people have started to use Facebook ads that this is happening, but most importantly, the reason why so many marketers have paid to advertise video on Facebook is that more and more brands realise the immense power of video in marketing. In other words, rather than creating a Facebook ad and including a photo or just a text, they’ve found that they can generate better results by using a video, due to its storytelling powers and ability to grasp the audience’s attention. 22% of people who watched a branded video ad visited the site named in the video ad. This is just one of many video marketing statistics which proves that videos clearly have an impact on people. Since videos are so engaging, people get curious to learn more about the thing they just watched a video about, and so, many people take the action of visiting the website of the brand that created the video. 59% of senior executives agree that if both text and video are available on the same topic on the same page, they prefer, and would choose to watch a video. Humans are visual creatures, we now know that. What’s more, most people also prefer to learn by watching videos as opposed to reading about something. This doesn’t just go for senior executives but for most people, and since that is the reality, you obviously want to create videos for your audience to consume. Ideally, everything you write text about, you should create a video about. Of marketers, 78% of marketers say their most effective SEO strategy has been creating more relevant content. Not only is video effective for marketing, but it is also tremendously effective for SEO as well. If you’re working with SEO, then you should definitely not neglect video. Using the word “video” in an email subject line has found to increase open rates by 19%. The open-rates of marketing emails has decreased heavily over the years due to the fact that almost all brands are using it and spamming their customers’ inboxes all day long. Email marketing has proven that it still is effective, but at the same time, you want it to generate as great results as possible, and it all starts with them opening your email. One way to do that is to include the word video in your email subject line because as you know by now from many of the other video marketing statistics, people prefer to learn b watching a video as opposed to reading. This also includes emails. Using the word “video” in an email subject line has found to increase clickthrough rates by 65%. Not only does including the word video in your email subject line increase open-rates, but it also increased click-through rates. This is great news because the goal of your emails isn’t just to get your audience to open them, but instead, it is to get your audience to take action in one way or another. And since videos are so loved, people will be much more engaged to click through. 69% of all global consumer Internet traffic in 2017 was made up by Internet video traffic. This is one of the video marketing statistics that tell us in which direction it is going, and at the same time, it proves just how big of a role it plays in today’s internet landscape. The interest and demand for video content have never been higher, and the fact of the matter is that this number will only continue to increase. If you neglect video in your marketing strategy now, you’ll regret it, because the demand for it is only increasing. And the last thing you want to do is start too late. 48% of marketers plan to add YouTube to their content strategy within the next year. Facebook is not only the platform which marketers are looking at when comes to distributing video content. And you should also remember that YouTUbe still is the largest video sharing platform in the world and which is the go-to source for the vast majority of people when it comes to sharing and consuming video content. YouTube has a huge audience which you can reach by uploading videos to the platform, and using YouTube alone as a part of your marketing strategy isn’t a completely bad idea, as you can generate amazing marketing results by leveraging it. All you need to do is create amazing videos that stand out from the crowd. But that is, of course, easier said than done. Native videos on Facebook (videos uploaded directly to Facebook) have 10 times higher reach compared to YouTube links, which are links to videos that have initially been uploaded to YouTube. This video marketing statistic doesn’t come as a surprise, really. What Facebook wants is to keep their users on the platform for as long as possible, but if people are sharing posts that link out to other platforms, such as YouTube, it will mean that people will have to leave Facebook in order to watch the video. Since Facebook don’t want their users to leave their platform, they reward those who upload videos natively to the platform, as opposed to linking out to a piece of video content to another site. What’s more, one of Facebook’s greatest competitors is YouTube, since they currently dominate the video landscape. This is a territory which Facebook wants to dominate over, and to attract people to turn to Facebook to upload a video rather than YouTube, they reward those who upload videos natively to the platform with tremendous organic reach. And obviously, if people find that they receive more engagement, more views, and a greater impact with their videos if they upload it to Facebook, then obviously a lot of people will abandon YouTube to upload videos to Facebook instead. The average CVR for websites using video is 4.8%. On the contrary, those who don’t use video only see an average of 2.9% CVR for their websites. 85% of businesses are likely to either begin or continue using video content in their marketing strategy in 2017. Video marketing is only going to get bigger and bigger. Video marketing rose significantly in 2017, but in 2018, it will become even bigger. If you’re still neglecting video marketing, you need to reevaluate your content marketing strategy and understand what you’re leaving on the table. Marketers increased their spending on mobile and digital video ads by 95% between the years of 2014 and 2016. If marketers are increasing their spend on video ads, there’s clearly a pattern. If video marketing wouldn’t perform well and prove itself able to generate amazing results, then obviously marketers wouldn’t be investing in it. But now they do. For companies that use video as a part of their marketing, the average cost per marketing-generated lead is 19% lower. Due to the great convincing powers of video, and its incredible storytelling powers, it is able to drive conversions and leads, and at a lower cost. Companies operating in the manufacturing and High Tech industry are the ones that publish the newest videos. There’s always brands and marketers saying ”I can’t create that type of content”, or ”I can’t do that” because they believe their industry is boring, and there’s nothing interesting to show. Apparently, the manufacturing and high tech industries are interesting and can, therefore, share content that people find extra interesting and captivating. Of US marketers, 70% of plan to use social video ads in the next 12 months. This is a trend that is only continuing to grow, and within the coming years, even more, marketers will implement video marketing into their strategies. 80% of users can recall a video ad they have watched in the past 30 days. This is yet another of the video marketing statistics which proves the things that I’ve been saying about video content. Video impacts us much deeper than any other type of content, and as a result, it leads to a greater recall. As a marketer, you don’t only want to reach your target audience with your message, but you want them to remember it for a long time to come. The good news is that video content helps you craft marketing messages that do just that. 82% of brands and marketers plan to spend more on video. Not only are marketers spending more on video marketing, but they’re also planning to further increase their video marketing spends. Close to one-third of total internet users, which is over one billion people, are using YouTube. youTube is the single largest video sharing platform in the world and is the platform for sharing of video content. If you’re working with video marking, or are planning to work with video marketing and are contemplating on what platforms to distribute your video content, YouTube should definitely be part of the equation. At the same time as 82 of marketers plan to spend more on video, 64% of them also see video as the most difficult content to create. By 2019, the global consumer Internet video traffic will account for 80% of all consumer Internet traffic. The interest and demand for video content is increasing. If you’re not creating video content yet, you definitely need to do so in the future if you are going to stay relevant in the competitive marketing landscape. Including a video on your landing page makes it 53 53% more likely to show up on page 1 of the search engine results page. Search engines love text-based content, but at the same time, search engines want to present search results which their users find relevant and interesting. And since people love to consume video content, search engines love it too! Therefore, make sure that video content is part of your website and the pages you are trying to rank. Video ads have an average clickthrough rate of 1.84%. This is the highest CTR of all digital ad formats. The CTR of display ads has decreased steadily over the years as people have started to completely ignore them due to them being everywhere on the web. This leads to terrible, or no ad recall, which obviously isn’t good news for brands using display ads. The good news is that while display ads have decreased in efficiency over the years, video ads stand out from the crowd since the majority of ads still aren’t video content. By creating video display ads, you’ll, therefore, be able to run ads that perform better than your regular display ads. 85% of businesses have internal video production staff and resources. Video Marketing has based on all of these video marketing statistics proven to be tremendously effective, but creating video content demands a lot of resources, and therefore, you need to ensure that you have the right people and knowledge in order to create high-quality video content to succeed. Of executives under 40, 51% reported making a purchase decision after watching a video. This is one of the many video marketing statistics that prove the immense convincing powers of video content. Companies that are using increased video analytics are more likely to be increasing marketing budgets for video this year. This is not very strange if you think about it. Video analytics allows marketers to evaluate and measure their results from their video marketing efforts, and when they can do that, they are also able to evaluate their results and see what works, and what doesn’t. Measuring and evaluating results is crucial in marketing as it allows brands to improve their marketing efforts to generate better results. When they generate great results from their video marketing, they’ll also be more likely to invest more money into it. Videos are six times more likely to be retweeted than photos. Since people find video content more appealing and engaging, they’re not only more likely to engage with video content or stop and watch it, but they’re also more likely to share it with their peers. Users on Periscope have created more than 200 million broadcasts. Periscope has been an emerging live video streaming platform which has, in just a few years, been able to build a large user base. If you’re thinking about making live video broadcasting a part of your video marketing strategy, you definitely want to consider Periscope. Videos are three times more likely to be retweeted than GIFs. While GIFs can be classified as a type of video content, videos themselves are far more impactful and can be used for storytelling in a way that GIFs cannot. This also makes video content more likely to be retweeted. 53.4% of marketers see Instagram videos as important in their marketing, According to Animoto. While Instagram is a platform where it was, initially, only possible to share photographs, video content is playing a bigger and bigger role on the platform, and today, more video content than ever is being shared on it. Since the interest in video content has increased, naturally, it starts to play a more important role in marketers’ content strategy on Instagram. 15% of people who watch a video visit the company represented in the video ad. Of marketers surveyed, 63% of said that Facebook has the biggest impact on their social videos. It has been debated a lot whether or not YouTube is a social media platform, but if you look past all of that, many marketers still see amazing results from their video marketing efforts on Facebook. Sure, Youtube is still the single largest video sharing platform in the world, but Facebook is gaining more and more traction when it comes to video content. If you’re working with SEO, you shouldn’t only focus on text-based content, but you also want to include video content to help convey your message and get your point across in a more engaging way. An important reason for this is that a ranking factor for search engines is the time you spend on a website, and since video content is more engaging than text, it increases the time people spend on websites, and thus also help you rank better on search engines and get more traffic. 62% of marketers say that they plan to increase their investment in Facebook video in the next year. Facebook tends to fall in shadow in favor for YouTube since it isn’t the largest video sharing platform in the world, but at the same time, Facebook is the single largest social media platform in the world, which means you have a tremendous opportunity to reach virtually anyone in the world. Businesses have an average of 293 videos in their video library. If you’re working with video marketing, one video isn’t enough. You need to consistently create video content and put out new videos for your audience to consume. Businesses that produce 50+ videos per year are 2.5x more likely to use advanced analytics. If you’re investing a lot of resources into something, you obviously want to measure the results from it. Measuring results allow you to see what is working and what isn’t, and thus take appropriate action in order to improve your results and get a better ROI. Therefore, it’s not surprising that businesses that invest a lot of resources into video marketing are also using advanced analytics to measure the results from it. If you’re not using analytics, you’re guessing, and this is something that no marketer wants to do. People comment 10 times more often on Live videos on Facebook compared to regular videos. Video content is engaging, but what is even more engaging is live videos. The reason is that live videos are recorded right on the spot and gives users the opportunity to engage with the broadcaster in real time. Live video allows brands to interact with their audience and get instant feedback from them, and this is the reason why live video sees more comments than prerecorded videos. 65% of executives have navigated to a vendor’s site after watching a marketing video. 39% of executives have called a vendor after watching a marketing video. Videos have proven to be tremendously powerful, and this goes for all types of videos. While marketing and promotive messages tend to work less well than other types of content that aren’t created for the sole purpose of selling, those videos that are created with the goal of selling still tends to outperform other types of marketing content. An important reason for this is the ability of videos content to sell, while not coming off as very promotive, as it can, at the same time provide value to its viewers. This is something that is very hard to do with other types of content. 96% of viewers find video helpful when making purchase decisions online. As a brand, this is one of the video marketing statistics you want to pay extra attention to. People often look at videos about products and brands before they buy something, and if you can create amazing videos, then obviously it will have an incredible convincing power. Viewers retain 95% of a message when they watch it in a video. Compare that to only 10% when reading the same message in text. As you know, humans are visual creatures, and process video content much quicker than text. What’s more, while a picture says a lot, thousands and thousands of pictures that make up video says even more, and at the same time, video content is much more engaging and impacts people on a deeper level, which leads to a greater recall. 47% of marketers report that that video has helped them reduce support queries. As a brand, you’re probably receiving a lot of support queries. These queries demand time and resources to manage, but if you can create videos that answer common queries you receive, people can have their questions answered without having to contact you. Of the videos that have been published the last year, 56% of them are less than 2 minutes long. When considering what length your video content should be, this is one of the video marketing statistics you can have in mind. The majority of videos are less than 2 minutes, and a reason for this is that people’s attention span is very short. If your video is too short, it will be difficult for you to keep your audience’s attention, and get people to watch your video from beginning to start, and you’ll experience a high drop-off. Videos that are less than two minutes tend to see the highest retention rate as it is a time which most people an spare to watch a video. By adding video to your social media content strategy, you increase the chance of having our audience engage with you by 10x. Since video content is more engaging than other types of content, naturally, you’ll see a higher engagement. 81% of marketers report seeing an increase in sales as a result of the usage of video content in marketing. 53% of marketers report that the number of support calls was reduced as a result of implementing video in their content marketing. If you can create videos that answer your audience’s questions, there will be no reason for your audience to call you for your support, thus saving you time and money. 67% of millennials agree with the assertion that they can find a YouTube video on any topic they want to learn about. Today, virtually all of the world’s information is available in video format, and the easy access of video content also leads to many people turning to video to learn about something as opposed to reading about it. By adding a video to your website, you increase your chance of a front-page Google result by 50x. Google wants to give their users a good user experience, and since people love video content, Google rewards sites that have just that with improved rankings and thereby more traffic. What’s more, videos increasing your retention rate and the time people spend on your site, which sends a ranking signal to Google that people found your website relevant to what they were searching for – something that also helps improve your rankings. By 2020, it is estimated that there will be almost a million minutes of video per second crossing the internet. The amount of video content available on the web will only increase, and therefore, the only way to stand out from the crowd with your video content, and be able to cut through the noise is to create unique, high-quality pieces of video content. By 2020, it is estimated that 82% of all consumer web traffic will be video. Prospects who view videos of a product are 85% more likely to buy the product. Brands that use video marketing grow their year-over-year revenue 49% faster than brands that don’t leverage video in their content marketing. Since video content is more convincing and gets people’s attention through storytelling, it’s not strange that it also helps brands increase their sales. 26.4% of professional marketer say that YouTube will be their main video sharing platform in the next year. That YouTube is the main video sharing platform for many marketers doesn’t come as a surprise when you also consider the fact that it is the largest video sharing platform in the world. 18.5% of small and medium-sized business owners say YouTube will be their main video sharing platform in the next year. This is definitely one of my favorite video marketing statistics as it gives us an answer to why video is so effective. Humans are visual creatures, and process visuals a lot faster than text. This does not only mean that people will be able to remember more of what the video was about, but also that we’ll find it more impactful and thereby more effective in marketing. North Americans have ranked video content as the number one content asset they would like to see from brands. 70% of marketers plan to use video marketing this year. Wednesday is the busiest day of the week when it comes to B2B video viewing. In the past 30 days, more online video content has been uploaded to the internet than the past 30 years of TV content. This just goes to show just how powerful and extensive video content on the web is. When it comes to video distribution for brands, company websites and social media are the two most popular distribution channels. With brands working with video marketing, the question of where they should distribute their video content is a common one. The two most common channels are social media and the company websites, and these are two highly important places where you should share your videos as well. On average businesses publish 18 videos each month. If you want to generate great results with video content, which I know you do, it’s simply not enough to just produce one or two videos and wait for the results to start rolling in. Instead, you need to create videos consistently and often, to keep your audience updated, and keep spreading your brand’s message. This is just like you would with any other type of content, for example on social media. 26% of video consumers looked for more information about the subject of the video after viewing it, according to Video Brewery. Since people find video content so engaging, it’s not strange that if they watch a video and find it appealing and interesting, that they will want to consume more videos to learn more. Another reason for this video marketing statistic is that it is so easy to consume video content and demands no effort from the viewer. 70% of marketers say that video is the most effective type of content for driving conversions. 80% of consumers think demonstration videos are helpful when making purchases. Something that limits people from buying something is fear or uncertainty of not knowing how to use it, whether it benefits them, or what they should do with it. If you can demonstrate how your product works, and how people can use it in a video, they’ll naturally become more likely to purchase it. 55% of people who watch videos pay close attention. This is more than all other types of content. Since video content has, as presented in several of these video marking statistics, proven to be so engaging, people will also be more engaged to pay close attention when watching it. This is great news for you since the goal of your videos is to impact your audience and get your viewers to remember the message of it. 63% of businesses use video for marketing. Consumers who watch demo videos are 1.81 times more likely to make a purchase than consumers who don’t. 87% of online marketers use video content in their marketing strategy. Video content is playing a bigger and bigger role in content marketing, not only because of the amazing results it is able to generate but also because of the increased demand for it. Views on branded video content have increased by 258% on Facebook as of June 2017. As talked about earlier, in order to compete with YouTube, the world’s largest video sharing platform, Facebook rewards those who upload video content natively to the platform with higher organic reach. This leads to more views for the brands and people who are creating video content. Views on branded video content have increased by 99% on YouTube as of June 2017. Aberdeen Group reports that 41% of marketers use video as part of their marketing strategy. Humans are group animals, and the psychology of humans make us trust our peers. Humans tend to trust the opinions of the crowds, and this principle applies to video content, too! Leverage the human psychology of testimonials, and implement them into your video marketing strategy. 55% of small and medium-sized businesses have produced or outsourced video production in the last 12 months. According to Animoto. The top 3 types of video content on YouTube are Product Reviews, How-Tos and Video Blogs. This is one of the more practical video marketing statistics that can help you get an idea of what type of video content people enjoy consuming, and most importantly, what type of video content you should create. Among tablet owners, 33% of them consume at least one hour of video every single day. 50% of consumers believe the right length for an explainer video is 1 minute. Videos up to 2 minutes long hold viewers’ attention the best, then the videos see a drop-off in views. After that, attention picks up again after 6 and 12 minutes long. This proves that people don’t have anything against consuming longer videos, but if you are to trust this study’s findings, there seems to be two type of people when it comes to consuming content. First, there are the people who want to consume short and snappy videos with a maximum length of 2 minutes. Then, there are people who want to consume more in-depth videos that are around 6 to 12 minutes long. A study found that 81% of consumers mute video ads. Of smartphone owners, 53% feel more favorable towards companies whose mobile sites or apps provide instructional video content. 4 times as many consumers would rather watch a video about a product as opposed to reading about it. 85% of the internet audience in the US consume video content. Of those that aren’t using video, 73% report to have bought a product after watching a video. 97% of businesses that create explainer videos say it helps users understand their business better. 39% of consumers say they are more likely to finish a video if it includes text, so they can watch it without sound turned on. As a result of an autoplaying online video ad, 82% of consumers have closed a browser or exited a webpage. 33% of video viewers will stop watching a video after 30 seconds. 45% of video viewers will stop watching a video after one minute. 60% of video viewers will stop watching a video after 30 seconds. Almost two-thirds of consumers prefer videos that are under 60 seconds long. 56% of video viewers are likely to skip online video ads. To the very last second, the average video retains 37% of viewers. 76% of people say they would share a branded video with their friends and peers if they found it entertaining. 79% of consumers prefer watching video rather than reading to learn about a product. Hubspot has found that that 43% of consumers want to see more video content this year. 22% of consumers engage with branded videos on Twitter daily. Of video consumers on mobile, 92% of them share videos with others. 90% of users think that product videos are helpful in the decision and purchase process. 60% of website visitors will look to see if a video is available before reading any text. The time users on Instagram spent watching videos increased by more than 40 percent in 2016. 45% of people watch more than an hour of Facebook or YouTube videos a week, according to Hubspot. People spend 3 times longer watching a live social video compared to a video which has been prerecorded. There’s no denying that there are an increasing interest and demand for live video, and as a brand, at least if you want to generate great marketing results, it is your duty to give it to your audience. Half of the 18-34-year-olds would stop what they’re doing to watch a new video that has been shared by their favorite YouTube creator. 40% of millennials trust YouTube for content. Video marketing has proven to be effective in essentially all age groups, but an age group that especially consumes visual content are millennials. If millennials are part of your target audience, then video content should be especially emphasized by you since it is one of the most effective ways to reach them. 78% of people watch online videos every week. People consume more content than ever, and we’re living in a world of information overload. Video content plays a natural part of the content that we consume online, and if you want your audience to consume your content, you obviously need to give them content which they want to consume. With video content being a natural part of the content consume every day, whether they watch videos for entertainment, to learn, or for a completely different reason, make sure that you put out video content and that you do it regularly, because if you only pt out content every now and then, while people consume it every day, quite quickly, they’ll have no content to to consume from you, and they’ll end up turning somewhere else. The top 5% of videos retain an average of 77% of viewers to the very last second. You’re not only creating video for the sake of creating video. Instead, you create video content because you are hoping to impact your audience with it and to get them to consume your message. While a challenge, your goal should always be to get your audience to watch your video to the very last second, and clearly, this, including several other video marketing statistics, prove that marketers are clearly struggling to get people to watch their whole videos. therefore, make sure that your video is attention-grabbing and appealing from start to finish so that it doesn’t experience any drop-off before it has ended. 60% say videos they’ve watched have changed their worldview. With video content, you have a tremendous opportunity right at your fingertips. The catch is that, while video is a tremendously powerful tool, a tool is only powerful if you know how to use it properly. Almost 50% of internet users look for videos related to a product or service to learn more about it, before visiting a store. This is definitely one of the most interesting video marketing statistics. It could prove that people first watch videos to learn more about the product in-store, or, it can be that they watch videos, and then become so convinced by the video they just watched that they decide to visit the store. Personally, I believe that it is a picture of both, but either way, it proves just how effective it is. The retention rate for personalized videos is, on average, 35% higher than for non-personalized videos. In Marketing, personalized videos are tremendously powerful. With personalization, we resonate better with the video and are more likely o continue watching. whats more, since we feel that people have spent time and effort creating something just for us, we’re more likely to value the video and therefore pay more attention when consuming it. More than half of all YouTube video consumption is done using mobile devices. Mobile usage is a trend that is only increasing in popularity. Therefore, when creating your videos, you need to have the mobile video consumers in mind and make sure that they get an experience watching your video, and can consume your message equally well as if they’d watch it on their computer. The average internet user spends 16 minutes and 49 seconds watching online video ads every month. People spent a lot more time-consuming video content as opposed to reading or consuming other pieces of content. What’s so interesting about this video statistic, in particular, is that this time only refers to the time people spend watching video ads, not just any type of video content. If you would add the time they spend consuming regular video content, the number would be much higher. The statistic, however, indicates that people are consuming video content, much more than they consume other types of ads, since video content, in general, is more appealing and engaging. Of viewers, 15% believe that a video ad should be no more than 15 seconds in length. It has been found that humans have a shorter attention span than goldfish, and this means that we have a hard time focusing on the same thing over a long period of time. If you want to have a high completion rate of your videos and receive almost zero drop-offs, then you should definitely be focusing on creating short-form content. Of all the videos that are watched on Facebook, 85% are watched without sound. Of all of the video marketing statistics in this post that refer to Facebook, this is probably the one you should pay the most attention to. WHat’s so interesting about this is that it directly affects the way your videos perform on Facebook. If you create videos where it is crucial for people to have audio on in order to get the message of the video, you can just imagine how much you’re leaving on the table. When a staggering 85% of people are watching videos on Facebook without sound, you’re clearly not getting your message across with videos that are heavily dependent on its audio. This is the reason why many people that upload videos to Facebook either include no audio, make it possible to get the key message without having audio on, and most commonly, includes subtitles for the video. YouTube has reported that the mobile video consumption on the platform rises 100% every year. This number is only climbing. Make sure your videos are optimized to be consumed in a mobile format. Just like mobile video consumption is increasing on Facebook, it does so on Youtube. Mobile usage is no trend that is just focused on a few platforms, but it is a universal internet trend that you need to pay attention to for continued marketing results. 72% of people would rather use video to learn about a product or service as opposed to other ways of learning, such as reading. If you haven’t already, you need to create videos about your products and brand, not just write about them. More than 500 million hours of video are watched each day on YouTube. Think about that number, because it just proves how important video content is in today’s society. As a marketer, your goal is to get people to watch your whole video, but 3/4 of a video isn’t too bad either. Make sure that the point you are trying to convey with your video can be extracted, even if people aren’t watching the whole thing. 90% of consumers watch videos on their mobile devices, according to Wyzowl. 82% of users on Twitter watch video content on the platform. Twitter is often a social media platform that is neglected when it comes to video content, but as this (as well as several other video marketing statistics) prove, video on Twitter is widespread, and should definitely be a part of your Twitter marketing strategy. 51% of all video plays are made on mobile devices. People spend an average of 2.6x more time on websites with video than without. Videos keep people glued to your website and gives you more time to convince people to buy from you and start trusting your brand. If you haven’t already, make sure you include videos on your website. Facebook gets more than 8 billion video views daily. Searches starting with “how to” on YouTube have increased by 70% year on year. People are turning more and more to video content when they want to learn something, and this is something that is worth having in mind when thinking about what type of videos you should be creating. Snapchat is sometimes neglected in video marketing, but considering Snapchat is a photo and video sharing platform, it is tremendously powerful for just that. I don’t think I need to anything else other than that I let the video marketing statistics speak for themselves. Clearly, video marketing work, and it works extremely well. But as with all marketing tactics, video marketing only works if you know how to use it. The video marketing statistics shows the immense potential that lie in video marketing. The question now is what are you going to do about it? NextHow Do You Download Videos on Instagram Direct Message?